All that glitters is golden at this New York City ice cream shop -- the first in the big apple to sell soft serve ice cream that is literally coated in edible golden leaf. Matcha N' More, located in downtown Manhattan, is a tiny hole-in-the wall ice cream shop that specializes in matcha green tea sweets and drinks. 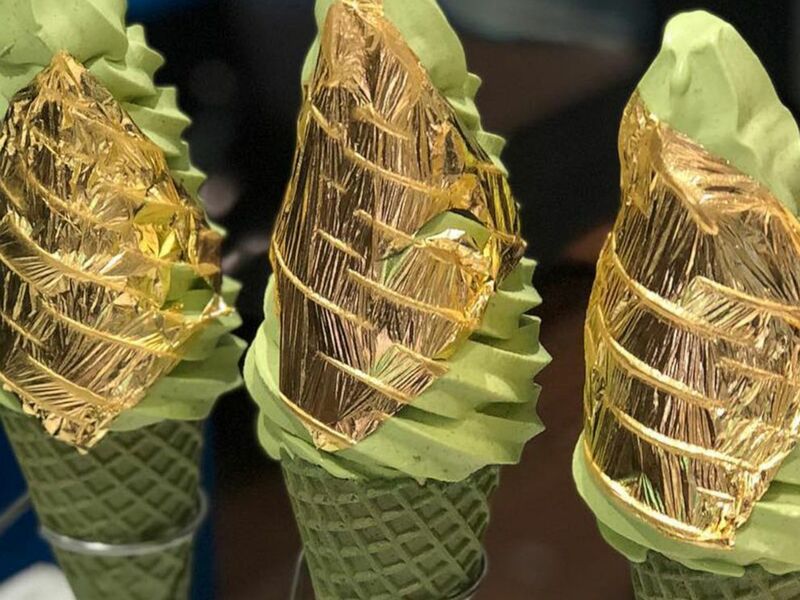 While their matcha soft serve cones alone are to die for, one of the more special things on the menu is their 24K Gold Leaf Matcha Ice Cream, which does in fact feature a paper-thin layer of 24-karat gold on top. This matcha ice cream is covered in gold leaf. The price point is a relatively inexpensive, $9, considering the gilded toppings. While adding gold to a dessert might seem like an Instagram gimmick or fad, eating gold leaf is a longstanding tradition in Japan, which is where the creators conceived of the concoction. If you're wondering what eating gold tastes like? Nothing, according to Lee, who described it's flavor as having "no taste whatsoever." He added that they also make sure they use the highest quality matcha green tea in ice creams. “We use ceremonial-grade matcha to make our ice cream, so it comes out really buttery and creamy and you can really taste the richness of the matcha,” he said. The best part about this matcha ice cream? It is "healthy," at least, according to Lee, who says it "has a lot of antioxidants."